Today I have a simple Christmas card to share. It comes together quickly and can easily be made assembly-line style. I cut, stamped, and embossed all my pieces first and then assembled all the cards. It’s simple but filled with warm Christmas wishes. The embossing folder I used is from Elizabeth Craft Designs, but it is no longer available. This Holiday Flourish folder from Echo Park would work great! Or just use whatever Christmas embossing folder you may have. The “Merry Christmas” stamp is an older one from Stampabilities – use your favorite Christmas sentiment stamp! And if you are in need of a scalloped oval die this set by Sizzzix is a great addition to your craft room. To make the card, emboss a panel of red card stock and attach it to a card made with kraft card stock. Cut 3 banner shapes from patterned paper. I cut one banner 4 by 1-1/2 inches and 2 banners 3 by 1 inches. I used this Banner Triple Punch from Stampin’ Up to punch my banner shape, but you can easily cut it with scissors. Attach 3 banners to the card. 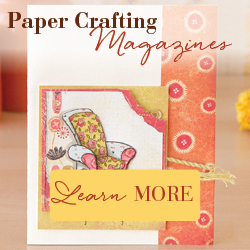 Stamp the sentiment on kraft card stock with red ink and die cut with a scalloped oval die. Attach it to the card with foam tape. Such a simple card – but filled with Christmas cheer! This entry was posted in Cards, Christmas, Stamping, Uncategorized. Bookmark the permalink.